The Spring 2012 Issue of The IDEAL Magazine is HERE! With Whitney Houston on the cover!!! 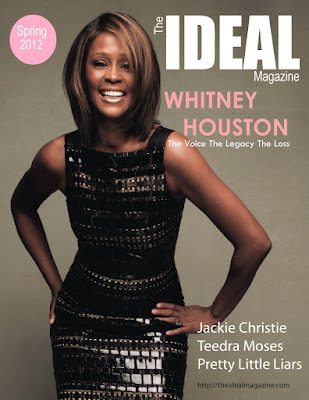 The IDEAL Magazine releases its Spring 2012 issue with Whitney Houston on the cover. We pay a special tribute to the late, great singer and explore what made her legacy so unforgettable. Singer Teedra Moses speaks about signing with Rick Ross' Maybach Music Group and the highly anticipated sophomore album release of "The Lioness." Basketball Wives Jackie Christie speak of her journey as one of the most famous basketball wives and discusses communication with the other basketball wives since the reunion episode. Photographer Manny Roman's career is explored as he is known to have one of the most coveted jobs shooting America's Next Top Models. Spring Fashion is shared and explored through Marni for H&M, Gucci, Alexander McQueen, PRADA and a host of other fabulous spring 2012 looks. The IDEAL 10 is special as its 10 of the coolest items to add to your gallery for the spring. With other great articles on Natural hair, spring cleaning for your life and getting that "to-do" list in order, the spring 2012 issue of The IDEAL Magazine is a must read.